An angler whom you should meet is Gary Metras (our interview with him here). He catches many fish, and here is one of them. I am excited that he is willing to share his presentation on winter fly fishing at the Swift River. The link is at the bottom of this post. There are many friendly anglers who know the Swift. They share their knowledge, and our Swift River overviews here, here and here also can help you. All that, and easy access, make the Swift a great DIY river. No guide needed. 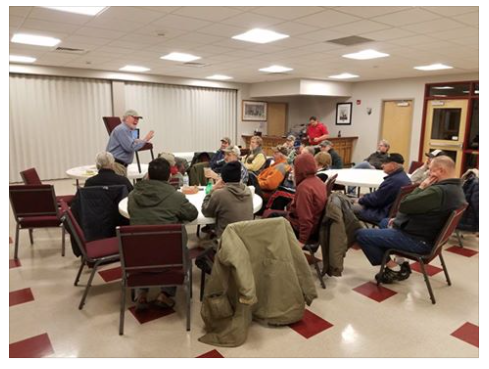 Gary recently presented at the TU Millers Chapter. He emailed over his presentation and is willing to share it with the fly fishing community. It is full of great advice and recommended fly patterns. It represents decades of assiduous angling and research, and so, we all need to applaud him. Thank you, Gary, for your generosity! Thank you, Will, for asking Gary! Mike, so great to meet in person at the Tim Flagler seminar! Always impressed with those anglers that can do well on the Swift River as I always found it a very technical river to fish do to fishing pressure and lack of glamour hatches. Great presentation Gary! Hi Steve, Gary is a clear master at this craft. Finding areas of quick water or broken water where the fish need to decide quickly and/or feel confident; that is the kind of water to where guides tend to point their clients (e.g., the upper- to mid-areas of the Hatchery Pipe, below the gauge, the Bubbler, parts of the Y Pool, etc.). I almost never nymph at the Swift and prefer dries, and forcing the trout to decide quickly to mask any bad drifts has been key for me. If you ever want to meet up at the Swift, would be a privilege to meet up. I have a feeling it would be a two-way street of knowledge sharing, but, that I would be the net recipient, given how much knowledge you have! Haven’t fished there in about 15 years. Moved my focus to the Farmington or the Chesterfield Gorge Area as there is more elbow room. If I could, I would, too! Awesome – thanks Gary and Jo for posting this. Excited to check it out! I really enjoyed that presentation and learned plenty from it. Thanks for putting that up. 18″ brook trout…holy cow! Thanks a lot, Jo. That is very generous of you. I will email you my address as I could use some small flies that I am not good at tying. No problem at all. Sending about 18 small midges for nymphing. HI Gary, such an epic presentation! 227 views in just 24 hours, with more on the way. When nymphing, do you use an indicator? I’ve never seen you use one and was curious. Got a really nice ‘bow yesterday in the Y-Pool on a #20 Simulium–a variation of my midge pattern. I did trap a grayish Similium at the Pool of that size. I tied my pattern on and caught that ‘bow right away. But that was the only one. Switched to a #20 red brassie and caught some on that. The Y-Pool is loaded now with weeds that, in some spots, the Spillway, the left side along the rocks, are only a foot or less below water level. Because the weeds are now so tall (I’ve lost a few good trout this past summer that dove into the weeds and I couldn’t work them out–one ‘bow, about 18″ worth, wrapped my line around the weeds so thoroughly that when it broke off, we could still see it flashing among the weeds for about 15 min. after which It got free, or sank to the bottom), that if I fish a sub-surface fly over them, I will use an indicator, but mostly so the fly doesn’t sink into the weeds and not just as a strike indicator, otherwise I prefer no indicator. So Zebra midges, small red brassies, and scuds are working well drifting among the weeds. Sometimes we can see trout cruising up & down the weed columns feeding on bugs. But if even only one trout is rising, even if only occasionally, I’ll fish dry flies. In the week before Christmas, before the deep freeze, there were good simulium hatches in the Y pool… lots of bugs on the water and fish rising all over. I had back to back days with double digit fish landed on dries in 3 or 4 hours of fishing (9x really made a difference). I also had a several days in November when there were sparse hatches (really just a couple of flies here and there), but the fish can really key in on simuliums, so even though the risers were few and far between, I still did pretty well. It took a lot of patience waiting and looking for a riser, but once I found one, odds of getting a take were pretty high. 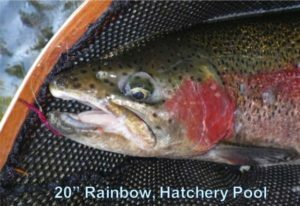 Hatches are certainly heaviest in the hatchery pool, but I haven’t found as many rising rainbows in that stretch in recent years (loads of nice little wild brookies coming up though). Brendan, great info. How about a blog post? Wow, 9x. My eyes are too old for that. My limit for dries is 6x. Congrats on the success! Brendan, you are exactly correct about the midge hatches and the need for light tippet. I usually use 8X in YPool, but break offs can be a problem unless one is delicate in hook set and playing the fish. Even had this past fall a 20” bow on #26 midge and 8X that I played all the way to the net when it saw the net, freaked out and broke off. A good ride.